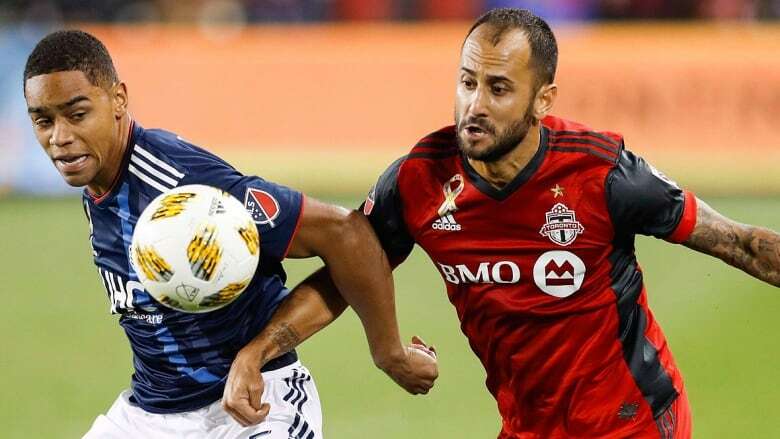 Toronto FC's training camp opened with a bang Tuesday with news that Spanish playmaker Victor Vazquez is headed to a team in Qatar. The sale of the popular attacking midfielder is pending a physical. Toronto FC's training camp opened with a bang Tuesday with news that Spanish playmaker Victor Vazquez is headed to a team in Qatar. The Major League Soccer club said it had come to an agreement to sell the attacking midfielder, but declined to identify the buying team. The sale is pending a physical. Vazquez, who turns 32 on Jan. 20, has been the straw that stirs the TFC drink in his two seasons in MLS. A product of the FC Barcelona academy and former Belgian Professional Footballer of the Year, Vazquez had 16 goals and 25 assists in 52 regular-season games. He scored the insurance goal in Toronto's 2-0 MLS Cup final win over Seattle in 2017. "We're going to miss him," said a subdued Toronto coach Greg Vanney. "Victor has been a loyal servant to the club and a fantastic player, and an even better person." The elegant Spaniard is a wizard on the ball, as he showed in games and in training. Vazquez was a popular player in and out of the locker room. His rapid-fire English quickly filled reporters' notebooks. Vanney said the Qatar offer was a long-term deal that extended beyond Vazquez's playing career. Giovinco also on way out? "I don't think we'll find a way to replace Victor exactly but we'll find a player or players that will also add to our team in this transition," Vanney added. Vazquez made $1.5 million US last season, fourth on the team payroll behind Sebastian Giovinco, captain Michael Bradley and Jozy Altidore. Adding to the somewhat negative tone of the day Tuesday was a comment by Giovinco who, like Altidore and Bradley, is in the last year of his contract. "I try to honour my contract," the Italian told reporters in English. "We'll see what happens. I want to stay here but I hear something already this season [that] somebody wants to offer me to another team." He declined further comment on the offer, which he called "serious talk." Vanney said that was news to him. Giovinco, the league's highest-paid player last season at $7.115 million, repeated his desire to stay in Toronto. The Italian, who turns 32 on Jan. 26, said he believes he has another six years playing ahead of him. Vazquez was missing from Tuesday morning's training session with a club official initially saying that he had been given permission to report late. After the session, the club informed reporters of the pending sale. Vazquez was slowed by a variety of ailments last season, restricting him to 21 league appearances (19 starts). Its playoff hopes gone, the team shut him down for the remaining three games of the season to undergo arthroscopic knee surgery. Vazquez has had chronic knee problems in his career, but was also dogged by a nerve issue and a sore back last season. Given his age and the work needed to manage his health, the Qatar offer for Vazquez made sense to Toronto from a business standpoint. But barring an equal replacement, the Spaniard will be missed. When healthy, he triggered the attack. "Victor makes you look better so it's nice to have him on the field," midfielder Jonathan Osorio said in July. "His brain ticks a little bit faster than the normal brain, especially on the pitch. It's amazing to watch." Vazquez was 11 when he joined the storied Barcelona youth system in 1997. He worked his way up and made a handful of appearances with the first team before his career was derailed by a serious knee injury in 2009. He made it back after a long rehab and scored for Barca, but there seemed little future for him at the star-studded club. He found a home at Club Brugge in 2011, earning league player of the year honours in the 2014-15 season. A 2016 move to Cruz Azul in Mexico did not work out so well, with his family unhappy in Mexico City. Toronto made him an offer and, by all accounts, he enjoyed his time here. On the plus side Tuesday, Altidore pronounced himself fit and hungry. "I can't wait to get to BMO [Field] and score goals." The U.S. international said late-season ankle surgery had fixed a problem that had got worse since being hurt in a Columbus game in 2017. The team reported for medicals Monday, meeting the media for the first time Tuesday. The squad flies to California on Friday for training camp at the University of California, Irvine. It returns Feb. 13 ahead of the CONCACAF Champions League round-of-16 match against Club Atletico Independiente on Feb. 19 in Panama. The second leg is Feb. 26 at BMO Field. The MLS season opens March 2 in Philadelphia. The only other players missing were Bradley, goalkeeper Alex Bono and midfielder Marky Delgado, who are with the U.S. team. Toronto is looking to prove that a 19th-place finish last season was a blip after its 2017 championship season. TFC is coming off a 10-18-6 season, which represented a 33-point drop from its then-record 69-point championship season in 2017 when it went 20-5-9. It was Toronto's worst season showing since 2013 when the club went 6-17-11 with 29 points. The club has made few off-season changes with defender Laurent Ciman and winger Nick DeLeon the two major additions. Gone are goalkeeper Clint Irwin, defender Jason Hernandez and forwards Tosaint Ricketts and Lucas Jansson, although Vanney says discussions continue about bringing back the latter player. Canadian forward Jordan Hamilton trained with the team Tuesday and is expected to formally rejoin the roster soon, along with midfielder-forward Tsubasa Endoh.